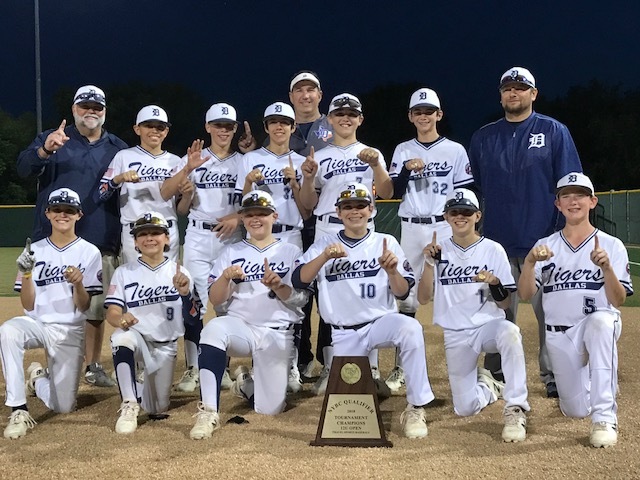 The 12U Dallas Tigers won the NYBC North Texas Qualifier this weekend after going 6-0, scoring 56 runs and outscoring their opponents 34-8 on Sunday. On the first game Sunday, Blake Lewis pitched a complete game shutout against Team Extreme, allowing only 5 hits and 1 walk. JT Cienga, Sawyer Farr and AJ Miera all had multiple hits and accounted for 6 of the 7 RBIs in the game and Brady Gray knocking in the 7th as the Tigers won 7-0. Game 2 saw the Tigers face off against a familiar and talented opponent in the Stix Black. After getting behind 3-0 in the top 3rd, the Tigers rallied in the bottom of the 3rd to score 4 runs that was started by a lead off home run by Johnny Castillo and Trent Bower would hit a 2-out, RBI double to get their first lead. The Stix tied the game in the 4th and Jake Overstreet came in relief with the bases loaded and one out to get the Tigers out of a jam and would end up pitching 2 2/3 scoreless innings. Louis Bussard tripled in the 4th and was driven in by a sacrifice fly by Brayden Bergman. The Tigers would score two more in the 5th to win 7-4 in a very competitive game. The semifinals found the Tigers squaring off against Marucci Elite. Louis Bussard had a high-quality start going 5 1/3 innings, giving up only 2 earned runs, walking one and striking out 4. AJ Miera would close the game on the mound getting two important outs as Marucci Elite had two on and 1 out in the 6th. Offensively the Tigers would score nine runs and Caleb Hoover the game with 3 RBIs and 2 runs scored. Brayden Bergman, Trent Bower and Sawyer Farr each had doubles as the Tigers won 9-3. In the championship the Tigers defeated the NTX Bulls by a score of 11-1. Trent Bower pitched a complete game giving up only 2 hits and 1 run. After giving up a single in the first, the next batter struck out and then Trent was able to throw a ground ball double play (two were turned in the game) and the Tigers never looked back from there. The Tigers would score 5 runs in the bottom of the 1st inning, led by a 2-run double by Caleb Hoover. The Tigers would add another 6 runs in the bottom of the 2nd. Brady Gray and Jake Overstreet also had 2 RBIs while Louis Bussard racked up 2 hits and 4 RBIs in the game.